What happens if I get clamped, how do I get it removed? That sinking feeling when you approach your car and see that the front wheel has been clamped. Not fun. You'll notice a note on your windscreen which explains why the car has been clamped. 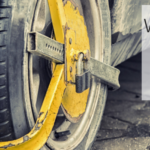 There are a number of reasons your car may get clamped and in this article, we'll take you through the why's and the how's of getting the clamp removed.